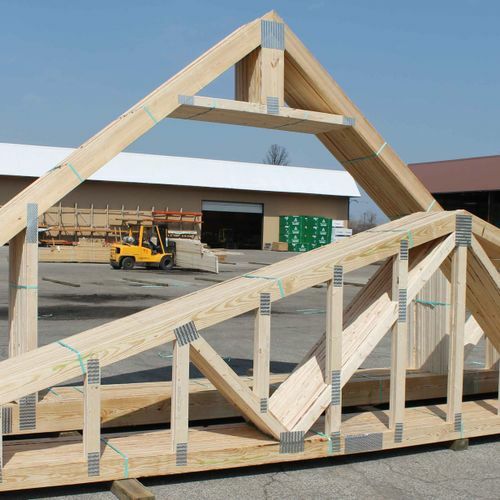 Located in West Michigan, Eastern Michigan, and Northern Indiana, we have the roof truss production capacity to keep up with the demands of the marketplace. Our team of designers bring over 250 years of combined experience; we value engineer everything from the most complex project to designing more concise plans. We offer customized solutions from gable to more complex hip roof designs; individual truss designs including standard trusses, scissor trusses, attic trusses, trusses with trey ceilings and more. We utilize the latest technology both in software and truss equipment to create the product that suites your specific needs. If your project is in the Multi-Family, Single-Family or Remodel space, we are the right choice to serve your needs. If you are in the Agricultural Industry, we have the equipment to build and ship trusses that span all the way up to 84’. No matter what region, our commitment is to bring the best experience to our customers utilizing streamlined distribution, the latest in technology, and a team with a continual improvement mindset.